I was sitting with my book, reading, on a bench in the main railway station in Gothenburg. I was hoping to get a good long way into my book. The corner of my eye noticed the man coming to sit down next to me. I didn’t look at him, but felt that perhaps he had sat down slightly too close. He turned to me and peered at the book. ‘Are you reading about love?’ he asked hopefully. He was foreign, and I only mention this because a Swede would not start a conversation quite like that. I was my usual charming self, not wasting a single word on this idiot. ‘Are you travelling to Stockholm?’ he wanted to know, presumably stumped by the demons. He was sufficiently astute to decide to leave and try some other witch, on some other bench. There was no love to be got from me. Not even a travelling companion to Stockholm. A big Thank You to Jon Mayhew for writing about demons, and not about love. Whenever I see Ian Rankin I feel so pleased. It’s like meeting an old friend. Then I have to remind myself that he doesn’t know me, and that I haven’t actually read any of his books. One short story. Maybe two. But now, now I have actually read one of Ian’s novels. What did I think? Well, for all that the Resident IT Consultant liked Doors Open, I found it slow, and long. I’m not sure what Ian could have cut, but it was too long for me, for the plot. Which is an Art heist, which is sort of fun and very cultured, albeit against the law. You meet the perpetrators and get to like them so it’s hard to know what to think. Should you approve of crime, when it is ‘just’ helping yourself to some art? But then you meet a really bad baddie, even though he drinks coffee at Cento Tre. But then you almost like him. And there is a worser baddie than him. And then you get to know the detective, so I wasn’t sure where to place my loyalty. Although I came to dislike the policeman after a while. The main character, Mike Mackenzie, is quite ‘nice’, but perhaps too rich and unthinking to be totally likeable. The heist goes well-ish. But you know something will be very bad, because that’s how the novel begins. So, what I really thought after what was a pretty solid performance from our Mr Ranking, was that it was OK and quite nice as Edinburgh crime goes. But for fast-paced heist type books that make you sit up and laugh and really engage with the characters, whether good or bad or just plain stupid, you want Donna Moore’s Old Dogs or Declan Burke’s The Big O or Crime Always Pays. Take my word for it. Donna and Declan don’t make quite as much money from their writing as Ian does. But they should. And I still love Ian Ranking, sorry, Rankin. Now I suppose Ian will never be my ‘friend’. I’ve been working on the Tim Bowler interview (which will be with you very shortly), and it was nice to see I made the news on Tim’s website. He’s either very polite, or has got his priorities all muddled up. Something – and I don’t know what it was, but it certainly wasn’t the speed of my dial-up this week – had me surf round blogs and websites. Nice to find that some of my favourites make it into translation. 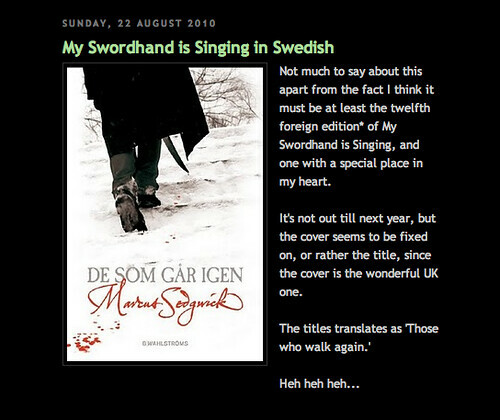 Here are Marcus Sedgwick’s ‘Swordhand’ and Chris Priestley’s horror stories, Swedish style. 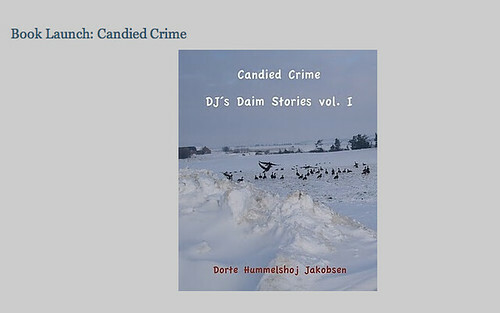 My Danish blogger friend Dorte Hummelshøj Jakobsen does not only blog in two languages, getting the English version correct, but she writes fiction as well. (I believe there might even be a paid day job somewhere and possibly household chores, too.) She has a small story collection available to buy online for those of you who are equipped with e-readers. That does not include me. I love the title, which is really witty: Candied Crime. Someone with a different kind of language issue is Rhys Bowen, the British crime writer transplanted to America. In her latest newsletter she told fans about breaking her wrist, which is delaying her next novel. Trying speech recognition software Rhys found it couldn’t quite deal with what she was hoping to write; ‘heir to the throne’ became ‘air to the thrown’ and ‘to let’ changed into what I always see it as when out and about and morphed into ‘toilet’. Seeing as I mentioned e-readers just now, Rhys says she has a short ‘Molly’ story (The Amersham Rubies) coming out soon, to coincide with her next Molly novel. Free on Kindle. And how does that help me? Well, that’s what she said, the bookshop assistant who answered the phone when we were ‘hanging’ nearby. Yes, she did have people who wanted to pay for stuff, but my idea of busy appears to have been warped by British shops. ‘It’s The Book Sale’ she told the caller, by way of explanation for the busyness. It was the second day of The Sale, so I trust they had been more swamped the day before. I could move inside the shop. There was the odd inconsiderate person in my way, but it wasn’t too bad. I was a little disappointed by the books, though. I wasn’t really thinking of buying, except I did get the idea from looking at someone’s blog last week that there was one book I might purchase. Couldn’t find it. Couldn’t find too much at all, to be honest. 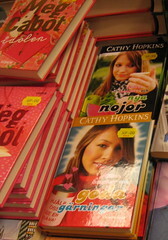 There was Sovay by Celia Rees, and a couple of Cathy Hopkins books. Big pile of Meg Cabot, and what looked like the collected works by Michelle Paver. All a little cheaper than before, but no giving-it-away prices. What I have still to find out is whether their appearance in The Sale of 2011 means you must give up all hope of buying them later. I think it does. When I wanted to buy more copies of Adèle Geras’s Facing the Light some years ago I bought the last copy in the country and after that you just couldn’t find it. (I know that makes sense. Last copy should indicate ‘no more’.) When Philip Pullman was given the Astrid Lindgren Memorial Award in 2005 I believe they had to hurriedly reprint his books in order to have anything to sell. He may be good, but he had been Saled before the award. On the other hand, selling out in The Sale is a nicer fate than becoming road fill. And if you’re really lucky there might be an award coming, if only because there are no more books. Debi Gliori was having a bit of a clear-out at home, so kindly offered to send me her Swedish translations. And you know me; I willingly took a step towards an even fuller bookcase than before. Now, secretly, I thought that I could always read and then pass them on, but I have to say from the beginning that those books are not going anywhere. I love them and they will stay with me. 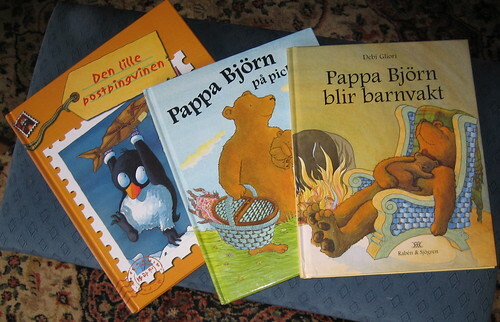 There were three picture books, two of which were about Pappa Björn, or Mr Bear to you. I hadn’t read these particular ones, from the mid 1990s, featuring our good Bear as babysitter and going on a picnic. He did try to appear rather inept with his babysitting, but Mr Bear is no fool. He knows what to do with a small child. The little Grizzlies didn’t know what hit them, once he’d allowed them to taunt him a bit to begin with. As for getting babies to sleep, he looks so comfortable that I will see if I can sleep on his tummy, too. OK, so he forgot to bring any food to the picnic, but seeing as he’s a dab hand at stealing honey, and so much more fun than the Grizzlies’ Dad, I reckon we’re on to a winner here, too. 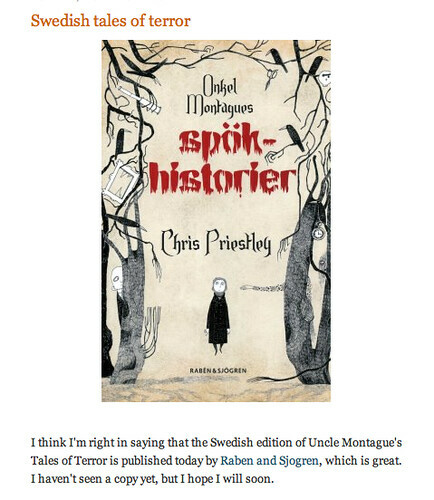 And then, the third book, well, it does look Swedish. But it isn’t. It’s Norwegian, and I have to say, all the better for it. There’s the Young Penguin who does the postal deliveries for his parents, and he looks so much more the part doing it in Norwegian. Daughter wasn’t impressed, however, as she encountered difficulties reading, but your capable witch was happy. Penguin Mum goes out for the day. Quite right, I say. Penguin Dad gets to stay at home sitting on the egg that will soon provide Young Penguin with a sibling. YP does the rounds, delivering baby slings for elks and pinky-red pyjamas for baby bees. There is clearly a good mail order business in penguin country (which looked like Norway), and he might be young, but he’s good at doing his parents’ jobs. Towards the end it turns out that he’s done more than anyone expected. The illustrations for all three books are wonderful, but my heart loved the penguiny landscape the best. Those colours! 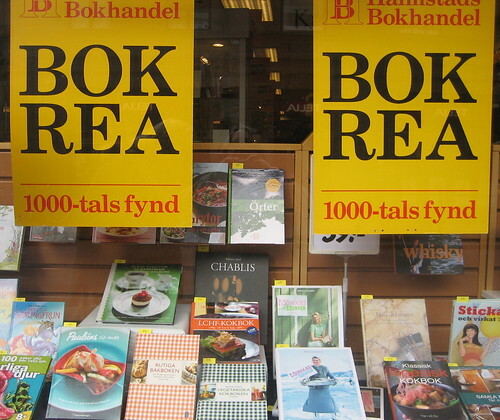 And from my source in a Swedish nursery, they have these books and they read them to the children. Couldn’t be better. What if it had gone the other way? This short anthology, edited by Marcus Sedgwick, takes history and turns it round. 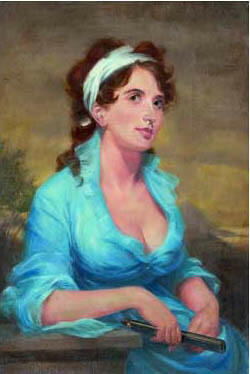 Some famous times in the past get a new look through eight authors. Marcus has rounded up some of our best writers, like Philip Ardagh, Frank Cottrell Boyce, Anthony McGowan, Linda Newbery, Mal Peet, Eleanor Updale and Matt Whyman, and asked them to rewrite history. I was fairly taken with Anthony McGowan’s Jesus, and I sincerely hope he will not get into trouble for this. Anthony, I mean. Jesus seems to have messed up, and he even passed on the Nike trainers. Honestly. And I loved Mal Peet’s character, almost from the first sentence of his short story. I knew Mal is talented, but this is quite spectacular. Linda Newbery does what she does so well, offering a tale from WWI. Philip Ardagh shows what a space nerd he is with his story about the moon, and Matt Whyman does other strange things to the same moon. Marcus gives a new side to Napoleon, and Eleanor Updale tackles the millennium bug, while Frank Cottrell Boyce has a related topic in the world ending next year. That’s after the Aztecs colonised Glasgow. At times I had to work to keep my wits with all this back-to-frontness. Makes you think. In among a letterbox full of junk mail, Daughter extricated three envelopes that vaguely constituted real post; like what to do with my rubbish over Christmas and a bill that should have been sent to the other address. Oh yes, and the rubbish people (the collectors of, who no doubt are very fine people) require the wheelie bin to be left with the handle facing inwards. Speaking of addresses that aren’t quite right, there was a postcard too. It was from people I’ve never heard of, including a Cenneth. (Please refer to my earlier blog about weird spellings of English names.) It was addressed to someone I’d never heard of. But at my address. My street. My number. No postcode. Almost my village, slightly misspelt, but it’s what people do. Thanks to the online telephone directory I was able to locate the real recipients of the card. 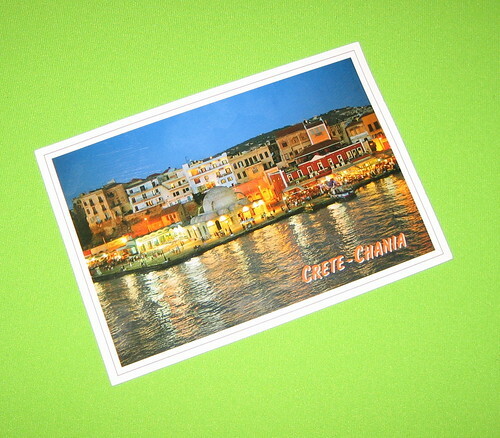 (Did I mention it’s from Crete? It looks very nice.) They live about a fifteen minute walk away, in a street that also has something to do with quarries. Like mine. I live at number ten. They live at number nine. Judging by the postmark, Cenneth’s holiday was in October. I may take a walk in that direction one day, seeing as I have a past in the postal trade.